Boulder Colorado has been embroiled in a rather bizarre investigation into the killing of a bull elk. Reports showed pictures of Boulder police officer Sam Carter allegedly posing with the elk which neighbors considered a local celebrity. They even held a vigil in its honor. Two Boulder police officers are now under investigation by the police department and a criminal investigation by Colorado Parks and Wildlife in the shooting. It is now believed that one officer shot the animal while on patrol. Another officer is then believed to have taken it home for the meat. Boulder police initially denied that the animal was shot. Now an officer claims that the elk appeared injured with a limp and some of its antlers broken off. However, witnesses insist that they saw the animal before the shooting and it appeared to be uninjured. The failure to report the shooting is on its face problematic since it involved an unreported discharge of a weapon. There was also no notice or consultation given to Colorado Parks and Wildlife. The state has a law called Samson’s Law addressing the shooting of trophy animals like the bull elk. The Samson law was passed by the Colorado legislature on April 22, 1998. Like this elk, Samson was a majestic bull elk named and loved by locals. After the poacher who killed Samson was fined only a few hundred dollars, the Samson law was passed and increased fines to $4,000 for a trophy sized antelope up to $25,000 for a bighorn sheep. A bull elk with six-point antlers can result in a fine of up to $10,000. There are also criminal penalties under hunting laws, though the officers could claim to be protecting public safety. 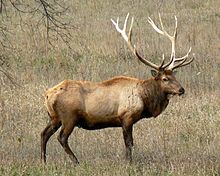 One witness said he found it curious that, after the police officer killed the elk and a sheriff’s deputy arrived on the scene, a third man showed up in a pickup truck to remove it. He said that it took the three men nearly an hour and a half to load the 800 pound animal into the pickup truck. Michaelb, Thanks for the update. of course, bearinboulder, this was a long plan to get a superior hunting trophy. Not surprised at all. There’s more damning news this morning. The cop who came by with the truck 1) had called in sick that day and 2) owns a taxidermy shop. This could be entirely innocent and there’s some indication that they were friends away from the job. Or it could be a strong indication of premeditation. that’ll teach that fu@kin elk to flip off a colorado cop. Police – n. Armed force for protection and participation. Whoever has a body that dies is a criminal to God. Whoever is like Jesus will not see his glory as hell. People condeminmg in the legal system acting like religious pharisees will see Gods glory as hell. A consuming fire. I always wondered where that predilection came from, my dad was Scots-Irish from Arkansas by way of Tennessee. I guess I now know. Bron, I was tempted to put up another bawdy song by some Scots, but if we got into that kind of game, the ladies and professor Turley would banish us to the Outer Hebrides. Some of the most scandalous folk songs you will ever encounter originated in Scotland. Well, maybe not Blouise, she probably knows them all already. I must respectfully disagree with you on moose beauty and agree with your daughter and AP. Have you ever SEEN a moose up close? It looks as if it is assembled from parts left over when all the other animals were created. But nevertheless, my daughter loves them. Her room is decorated with moose pictures and figurines. Even her ceiling fan has a moose theme on the decorations. My son had a freezer full of moose meat, and it is good lean meat. But, dang, that is one ugly animal. It would be easier to talk my daughter into cooking Bambi than Caribou. As you probably know, Caribou and Reindeer are the same animal, it is just that domesticated Caribou are generally referred to as Reindeer. I have a number of pictures of her standing in the middle of a herd, all the animals gathered around her as she hand fed them treats. She loves them and moose. I don’t understand the moose thing, because if the Creator put an uglier animal on the planet, I have not heard about it. bison is outstanding. I am not a big fan of whitetail although I had some sort of asian deer that was very good. Get some elk if you can, it is really good stuff and so is caribou.